It’s always freaky when several of my interests collide. Crime, old-time radio, and classic movies–it all comes together in this photo of the FBI photographing Margaret O’Brien. This is not a great radio show. In my experience, the cheese factor in old-time radio correlates directly with the number of organ flourishes a show contains. But this show’s subject–how the FBI lab helped police solve crimes in the 1940s–intrigues me. Adventure Ahead was a Saturday morning show aimed at young boys. In this episode, a boy tours the FBI crime lab and learns how agents help solve crimes through blood and hair analysis, ballistics, and fingerprint identification. Because I live near America’s largest fingerprint database, I paid special attention to the information about FBI fingerprint files. After listening to the show, I couldn’t resist doing some research on the history of fingerprint identification and how the FBI collection has changed over the years. Soon after J. Edgar Hoover became FBI director in 1924, the Bureau established an Identification Division. Within nine years, it contained 5 million cards. By 1944, when this radio show aired, these numbers had soared to 91 million. 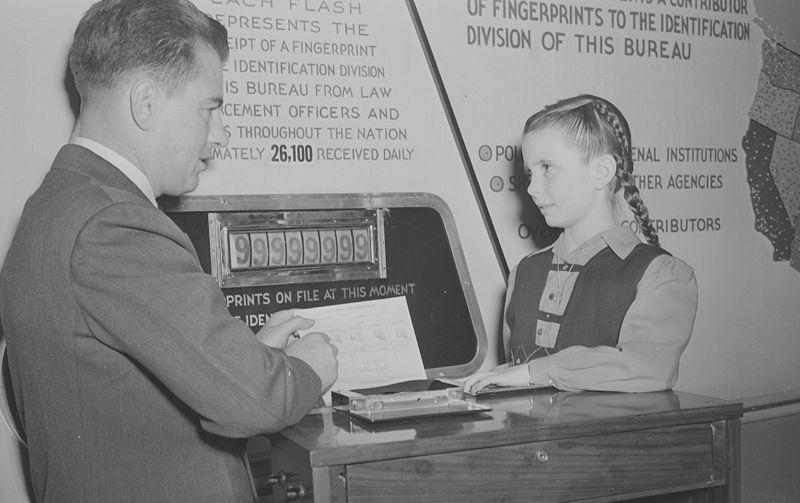 Actress Margaret O’Brien provided the Bureau’s 100 millionth set of fingerprints two years later. This radio show describes a fingerprint matching system that involved punched cards and “steel fingers.” The FBI first used computers to search fingerprint files in 1980, but didn’t establish a fully computerized system, the Integrated Automated Fingerprint Identification System, until 1999. The FBI is now building a huge database of other biometric information, from iris scans to tattoos. Notable Cast Members: Robert Young, who shows off his fatherly side well before Father Knows Best appeared on radio and then TV, and 6-year-old Margaret O’Brien, recreating the movie role in which she made a name for herself, literally and figuratively. Four-year-old actor Billy Severn also appeared—it must have been terrifying for the director to rely upon such young children in a live radio drama. O’Brien does a great job, and Severn is adorable. Story: A war-weary American journalist and his wife, in London during the Blitz, lose their unborn child and decide to adopt a traumatized war orphan. Based Upon: The successful 1942 movie of the same name, in which Young and O’Brien also starred. The movie, in turn, was based upon the novel by journalist William L. White, and that was based on his true story of adopting a British war orphan. Life ran an interesting story on the “real Margaret” (not revealing that her name was actually Barbara), who would grow up to carry on her family’s journalistic legacy. Also, when the pregnant wife and her husband share a toast, she drinks milk. This surprised me and got me wondering how long doctors have been advising pregnant women to avoid alcohol. I didn’t find a definitive answer, but this history suggests alcohol’s potential harm has long been common knowledge. My Verdict: These short movie adaptations work best when you haven’t seen the movie, which I haven’t in this case (although I want to now). As a radio story, it feels complete, and Robert Young and the children give enjoyable performances. Based Upon: The John L. Balderson play Berkeley Square, which was a hit when it opened in 1929. This time-travel romance was also a hit with old-time radio audiences, if you can judge by the number of shows that adapted it. Story: Peter Standish longs to leave the 20th century behind. Obsessed with the diaries of an 18th century ancestor, he soon finds himself living his ancestor’s life. Complications arise when he falls in love with the sister of the woman his ancestor married. Setting: Berkeley Square, a perennially fashionable London neighborhood. Notable Cast Members: Ronald Colman plays Peter on Everything for the Boys, a wartime dramatic anthology. Greer Garson plays his love interest, Helen. Victor Jory stars in the Dangerously Yours episode. David Niven stars in the Hallmark Playhouse version. About the Programs: Everything for the Boys ran for 21 weeks, with Colman hosting and starring in each episode and the legendary Arch Oboler writing and directing. Each episode ended with a short-wave call to fighting men overseas—this was a major technical challenge then and didn’t always work. The romantic anthology Dangerously Yours was also a short-lived 1944 show with a regular leading man—Victor Jory. After 16 episodes, it morphed into Vicks Matinee Theater. The high-toned Hallmark Playhouse presented Hollywood stars in literary adaptations. My Verdict: Without having seen or read the play, I can’t say which version adapts it most faithfully. In all three versions, the time travel is abrupt and unexplained. The Everything for the Boys script adds an extra layer of resonance to the play by giving it an explicit World-War-II context. This makes it easier to see why Peter wants to escape the 20th century, why Helen is so horrified by her vision of the future (she sees men, women, and children being herded into open graves), and why Peter feels he must return to his own time and address its challenges. Also, Leslie Howard starred in the original Berkeley Square play and the 1933 movie version. Story: An American journalist assigned to London finds himself disgusted by out-of-touch, imperialist aristocrats. He falls in love with Polly, a bitter working-class woman, who refuses to support a war she thinks will benefit only the rich. Notable Cast Members: Cathleen Cordell, who plays Polly, went on to have a long career as a character actress in television. I think William Quinn, who plays Dave, may be the same person as Bill Quinn, another prolific TV character actor. About the Program: Words at War was a dramatic anthology that told timely stories from the world’s literal and figurative battlefronts. The New York Times called it “the boldest, hardest-hitting program” on the air. My Verdict: Once you get past some heavy-handed British stereotypes, this is an interesting, nuanced story. Polly is a shockingly unpatriotic character by wartime radio standards. At one point, she even cries, “Let Germany win! Let Germany win!” Dave, playing devil’s advocate, tries to convince her that World War II is a “people’s war.” He interviews working people who are glad to make sacrifices and an aristocrat who is paying 97.5 percent of his income in taxes, but Polly remains unconvinced. When Dave loses his leg in a bombing, I thought sure the writers would give Polly a quick attitude change. She does agree to take Dave’s place in a war plant (where he’s begun working because his newspaper superiors banned him from writing about war’s effect on “the little people”). She stresses, however, that she’s making this choice based on love, not patriotism. A reviewer of St. John’s novel noted favorably that the book “makes a passionate plea for general understanding of the bitter hatred the common people in war-torn countries feel toward rulers who quit them ingloriously, shamefully, taking with them their loot and their foolish hides.” In the 1950s, author Robert St. John was blacklisted as a Communist, a label he disavowed. It’s sad but not surprising that his concern for the world’s common people would suggest Communism to 1950s red hunters. Final Fun Fact: At one point, Dave and Polly visit a pub, where the crowd sings this song.